Home > Printable Coupons > Right Guard Coupon | Body Wash and Deodorant $1 at CVS Next Week! 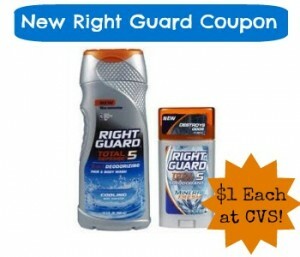 Right Guard Coupon | Body Wash and Deodorant $1 at CVS Next Week! Hurry and print this new Right Guard coupon for a hot deal at CVS starting Sunday! Pick up Right Guard body wash and deodorant for just $1 each! Also starting Sunday, Walgreens will have Right Guard deodorant on buy one get one free sale!